Do you share your dinner or perhaps a bite of your snack with your furry little friend? While dogs are just too cute to say no, especially when they look at you with those adorable puppy-eyes, human foods are not appropriate for dogs. The digestive system of dogs are different than that of humans and certain foods can actually be harmful for your canine. 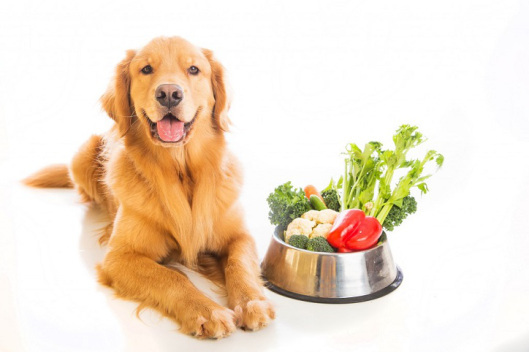 It is important that you inculcate healthy food habits in your dog from as early as possible. But for that you need to discipline yourself as well. For instance, stop giving your dog treats throughout the day; instead, follow regular meal times. Also, avoid over-feeding your dog and don’t encourage feeding from the table. You need to teach your dog to differentiate between dog food and human food and provide them with high quality canine food that are designed to keep them healthy. The following are 4 top food habits you need to teach your dog. According to a Brandon pet care center, fresh vegetables and fruits are essential for your dog’s health. These whole foods are packed with live enzymes and fiber, which helps digestion and improves their defecation. While dogs are carnivores and meat is their natural food, an all-meat diet also contains higher toxin levels. Fresh vegetables and fruits, on the other hand, help alkalize the body and help your dog avoid developing chronic diseases. In fact, vegetables and fruits can be a great alternative to the store-bought shelf-stable foods that you often serve as snacks. These shelf-stable foods have a longer cooking processes, which kill many of the nutrients. As a result, synthetic nutrients are added to the products to retain their food value. However, unlike synthetic nutrients, fresh vegetables and fruits have nutritional co-factors that help the body to better absorb and assimilate the nutrients. So next time you want to treat your dog, try a piece of carrot. In fact, it is also a good bone substitute for your dog’s teeth and gum maintenance. Pure vegetables too is a great option for maximum nutrient absorption. However, also remember that certain vegetables and fruits (and also parts of certain vegetables and fruits) can be poisonous for your dog and should be avoided. Talk to your vet before you start feeding your dog these whole foods. Does your dog just sniffs his food and rejects all but a few bites? You probably have a finicky dog! Now, there are many reasons for his behavior, ranging from his health to what and how you are feeding him. A dog can become finicky if he is sick; so if you observe that your dog has not only lost his appetite, but is also avoiding regular play and behaves in a disengaged manner, it’s time to get a vet appointment and get a thorough check-up. However, remember that it may take a little time to eliminate the finicky eating behavior. In addition, you need to careful about certain things when it comes to counter conditioning your finicky dog. If you are changing his food formula, do it gradually. For example, if you are changing from wet to dry food, mix the dry food with a small amount of warm water if the beginning. Also, combine the new food with the old food to help your dog get accustomed to the new food. While we don’t want our dogs to become the hunters that they have descendent from, cooked meat is something you can avoid feeding your dog whenever possible. When we cook food, we lose many beneficial nutrients. The same happens when you cook food for your dog. The reason behind this is that the muscles of animals when cooked at high temperatures, releases carcinogenic chemicals called heterocyclic amines (HCAs), which may increase the risk of cancer. And this too applies in case of your dog. If you still prefer to feed your dog cooked meat, try searing it slightly rather than cooking it through. Healthy fats are essential for your dog’s health, especially for his coat. For example, if you dog has fatty acid deficiency, it is more likely to have a dull coat and have dandruff and a dull and flaky skin. Fortunately, most dog foods are very high in Omega-3 and Omega-6. Additionally, you can also feed your dog supplements and certain whole foods like chia seed, flaxseed, hempseed, and small amounts of fresh sardines. It is better to avoid fish oils (or at least consult your vet before feeding them to your dog) as they turn rancid very easily and can affect your dog’s liver and kidneys in the long run. Also avoid giving too many fatty acid supplements, as it may cause upset stomachs and vomiting. Nobody knows your dog better than you, so you are the best person to judge your furry friend’s diet. Discipline your dog from day 1 when it comes to food. Don’t ever let the guilty of leaving your dog alone at home make you feed or treat him more often. Learning healthy food habits takes time; be patient, your furry bundle of joy will eventually reach there and enjoy a healthy and strong life.